National Museum of Taiwanese Literature and the Tainan City Government Cultural Affairs Bureau are working together to host a series of events called “A literarate spring, beautifying the city". They hope to invite people from around the island to experience the cultural side of Tainan before the arrival of spring. So Tainan residents can learn more about the Min-Sheng Greenway Cultural Park, NMTL has published 20,000 copies of "Travellers' Postcards" featuring photos of historic sites such as the NMTL, Confucius Temple, Old Tainan Prefecture Hall, Tainan City Fire Bureau, and the Tainan City Police Station. Buyers can color these postcards, and the first 100 senders can send them for free. 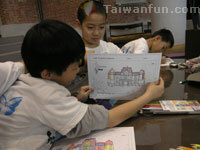 There is also an event called "2008 Warm Spring, We're at NMTL," where kids 12 or younger can participate in the coloring contest. Starting January, parents can take their kids to the museum on Saturday afternoons (3-4 pm) and visit the "Happy Weekend Story House." Check their website for details. 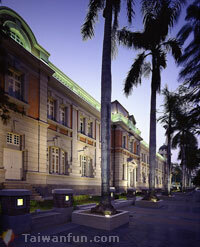 The National Museum of Taiwanese Literature building was completed in 1916. 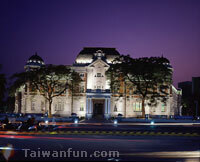 It originally served as the Tainan District Hall during the Japanese Colonial Period. The building deteriorated after World War II, and restoration of the building began in 1997 and was completed in 2003. Consequently, the museum became an important example of how historical landmarks can be restored to good use and also demonstrates how literature, culture and history can be united. ●The exhibitions, library and the children's reading rooms are free to be explored all year long, all visitors are welcome.